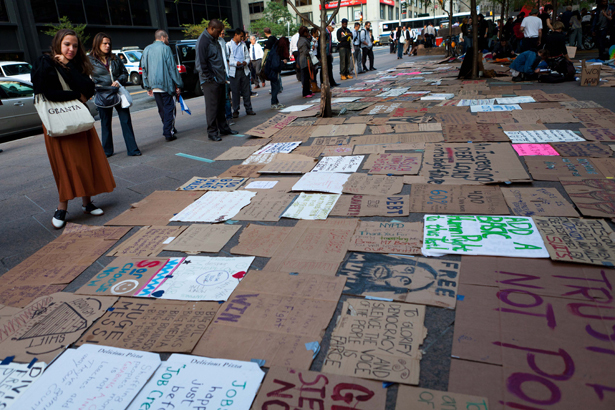 It’s been a year since the Occupy movements of 2011, and like other participants, I’ve been thinking about their legacy. In Spain, Greece, Britain and the United States, relatively small numbers of protesters made a big noise about the evils of capitalism; to me, though, the movement’s lasting gift was embodied in the very word “occupy.” The protests occurred in spaces where they did not belong, taking place in plazas (New York), on church steps (London) or in commercial squares (Madrid), where protesters had no right to assemble. The Occupy movements dramatized questions about public space—who owns it? who can use it?—and provided some surprising answers. In America, in principle, there should be no “public” problem. The First Amendment to the Constitution reads in part: “Congress shall make no law…abridging the freedom of speech…or the right of the people peaceably to assemble.” Over the centuries, this right has been refined and hedged, but it still hews to the opinion of the Supreme Court in 1875 (in United States v. Cruikshank) that freedom of speech is “an attribute of national citizenship.” This guarantee is broader than in the unwritten British constitution, which accords freedom of speech mainly to those speaking in Parliament, and more precise than the vaguely worded right to assemble accorded citizens in Spain or Greece. Across the board, though, freedom of speech and assembly is defined in terms of the relation between citizens and their national government. However, the rights that nations give, cities can easily take away. In New York City, for instance, you need permission from the local authorities if more than twenty people gather in a park, or more than fifty bicyclists parade on a street, or if the speakers use amplified sound. Washington, DC, requires permits for twenty-five people to assemble on the National Mall; a march along the streets can be permit-free only if it involves fewer than 100 people and keeps to a single lane. Today, London is more draconian than either New York or Washington as a result of the anarchic riots that occurred six months after St. Paul’s Cathedral was occupied; political protesters are now lumped together with looters as threats to public order. Local freedom has been ambiguous in Madrid and Athens, since many of the police themselves have spontaneously demonstrated against austerity cuts; still, crowd control through the use of tear gas or water cannon is a decision for local authorities to make. Tents and sleeping bags were the “weapons” with which the Occupy movements tested each city’s limits on freedom of assembly. When allowed, legitimate protest is usually framed by the idea that protesters will pass through public space, not dwell in it—the march rather than the camp. (The occupation of Beijing’s Tiananmen Square in 1989 violated this norm on a much larger and infinitely more tragic scale than the camps set up last year.) The Occupy settlements were clever, however, in exploiting two ambiguities in the notion of public space. The first is an ambiguity in the distinction between “public” and “private” in urban areas. In 1961, New York City passed a zoning resolution that allowed a new building to become very tall if the developers agreed to make space at the building’s base open to the public. Which has meant that Zuccotti Park—in the very belly of the Wall Street capitalist beast—must be open twenty-four hours a day, seven days a week, to the public, though it’s still privately maintained. By camping in this park (which is really a plaza, since it’s tightly knit into the surrounding street fabric), the protesters raised the question of who controls such space: the police or the building’s owners? While the authorities dithered, the Occupiers occupied. The second ambiguity is between secular and sacred space in the city. London Occupiers established themselves on the north flank outside St. Paul’s, crowding near but not blocking the main door to the west. At first the church fathers were of a mind to call in the police; however, this violated a tradition established in the Middle Ages that a church should provide sanctuary in the city, offering refuge in cloister gardens for the poor and outcast. Citing this tradition, the dean of St. Paul’s argued against his superiors and resigned. His superiors dithered too; eventually the archbishop of Canterbury, Rowan Williams, weighed in, arguing that sanctuary applied to political protesters. The ambiguity, though, was that the Occupiers were not seeking invisibility, as an outcast might; whenever a congregant went into church, he or she passed next to an often noisy anticapitalist gathering. Shortly after the protests ended in New York, architect Henry Cobb, landscape designer Ken Smith and I had a chance to compete for a redesign of the base of the National Mall in Washington, including the pool and surrounding area nearest Congress. The original brief was to design a space for free speech in the nation’s capital, but that shifted when Congressional officials took charge of the project; they feared protests too close at hand. Still, it seemed to us that we could design a space for people to occupy, informally, for just lounging about if not protesting; the lesson of Zuccotti Park for me was that ambiguous public/private space—which the mall is, in its own way—creates an opportunity for unscripted participation. We designed a place equally family-friendly and protester-friendly. We lost the competition, which is perhaps not surprising, but the idea of unscripted space has stayed with me; in the coming year I’ll be working with activist Stephen Duncombe on such spaces for free speech in New York City. Efforts like ours (a similar project is under way in London) are paper exercises, but such images can throw grit, as it were, into the machinery of official planning. More generally, urbanists now want to loosen the vise-like grip of regulation to enable urbanites to bring public space to life; the Occupy movements have offered one razor-sharp lesson in where to do so. But this impulse also opens up a big question, that of how to create truly public/private shared space. In the past half-century, cities around the world have privatized the public realm of the city, as in the gated community whose streets and amenities are no longer open to ordinary citizens. More insidiously, metered parking on streets is a daily privatizing of public space, as though the immobile cars own the street. Sometimes forceful planners can countervail—as with New York City Transportation Commissioner Janette Sadik-Khan, who has taken back much of the streetscape of midtown Manhattan—but these victories are tenuous as well as arduous. The structural trend is to take away those spaces the public can call its own. The Occupy movement in New York and London had to be quite clever to find ambiguous sites to colonize, but it raised awareness that these places are few and far between these days. The other legacy is perhaps more subtle. Religious sanctuaries in the city have been all about offering protection to the vulnerable or spaces of meditation for the devout. When these sacred spaces are put to secular use, what do they offer instead? At the Occupy sites in Zuccotti Park and outside St. Paul’s, I was struck by how much downtime the people who’d camped out for days together had (since you can’t spend every hour of the day and night chanting). The Occupiers in both places were good self-organizers of such downtime; soon after Zuccotti Park was taken over on September 17, 2011, working groups were set up for food, sanitation, comfort and medical needs; in London, the camp outside St. Paul’s was nearly spotless. These protected spaces did shelter the truly down-and-out, but they also harbored middle-aged unemployed office workers or old-age pensioners, as well as the articulate lefty students you would expect; in London, the site even drew off-duty police officers who were faced with losing their own jobs shortly. During those periods of downtime, the mélange of people chatted, traded life stories and cleaned. Sanctuary provided an experience of temporary community. To be sure, the numbers of people who experienced this social bond were small. Though the statistics are imprecise, the most impartial estimates put about 200 people sleeping in Zuccotti Park before the encampments were shut down by the police on November 15; the London site had about 200 tents. Still, the social bond experience may help explain why—when asked by journalists, “What do you want? What’s your program, your policy?”—the Occupiers often responded, “You don’t get it.” Over time, the point became being with by making a space where they didn’t belong into their own. Though temporary intimacies of this sort are easy to romanticize, over the last year I’ve found the experience more and more provoking; it’s challenged some long-held beliefs. Jane Jacobs once famously declared that “if density and diversity give life” to public space, “the life they breed is disorderly.” In my planning work, I’ve translated this idea into practice by seeking to make self-contained public spaces more porous—for instance, by extending open-air markets into side streets in Beirut or punching more doors into single-entrance buildings in London. Porosity has been a guiding principle for other urbanists inspired by Jacobs, from Jan Gehl in Copenhagen to Charles Correa in Mumbai. Following this guide, we know public spaces can stimulate the bodily senses of smell, sound, sight and touch in an informal if disorderly fashion. By contrast, the informal exchanges that the orderly, temporary communities of Occupy stimulated during downtime were more verbal than visceral. Porous or protected public space? This abstract issue, which I’ve been turning over in my mind the last year, has a sharp political edge. The Occupy sanctuaries were, at best, semi-legal: you had to fight the authorities for that space. Richard SennettRichard Sennett, who teaches at New York University and the London School of Economics, is the author, most recently, of Together: The Rituals, Pleasures, and Politics of Cooperation.